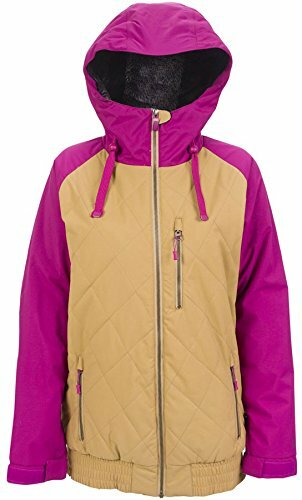 Powder Room City Ski Jacket 2015 Berry/Cashew XS All of the style and the performance. A Snowboard team favourite for the look fit and feel. The quilted baseball feel and colour blocked sleeves that are appearing throughout the fashion world included in a snowboard ready jacket. An elasticized waist to keep the cuff in place and accents including a Sherpa like layer on the for warmth and metalox aka metal like waterproof zips make the City a must have. Style Materials 100 Nylon Twill Strategically seamsealed zippered flowthrough venting with inner mesh gusset Waterproof zippers have two membranes Adjustable snow skirt with gripper tape Elasticated waistband with drawcord system Media pocket with headphone port . Insulation PrimaLoft Silver Insulation ECO Primaloft silver insulation uses post consumer recycled materials to create the highestperforming ecofriendly insulation available. The wet performance experts at the PrimaLoft brand have combined this 70 recycled fiber technology with a proprietary waterrepellent treatment for immediate warmth without the bulk that keeps you comfortable in wet weather. Highly compressible and with a soft feel that goose down the bestinclass ecofriendly insulation offers insulation that performs with a conscience. . Waterproofing Breathability 10000mm Waterproofing / 10000g/m2/24hr Breathability Microporous membranes are laminated to the underside of the fabric. Invisible to the naked eye these pores are large enough to allow perspiration vapour to escape but small enough to create a weatherproof seal against rain and snow . Powder Room. Insulated. If you have any questions about this product by Powder Room, contact us by completing and submitting the form below. If you are looking for a specif part number, please include it with your message.